Preheat the oven to 350°. Crush the Lorna Doone cookies and reserve about 1/2 cup of the crumbs for the topping. Mix the cookie crumbs with the melted butter. Press them into the bottom of a 9x13-inch glass baking dish. Bake for 5 minutes and then cool completely. In a large bowl, combine the softened cream cheese, powdered sugar, and 1 container of the thawed whipped topping by stirring by hand. Once thoroughly mixed, spread the mixture over the cooled crust. 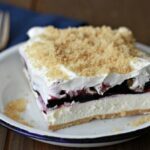 Drop dollops of the blueberry pie filling over the cream cheese layer and spread carefully. Sprinkle pecans over the pie filling. Top with the remaining container of whipped topping and sprinkle with the reserved crushed cookies. Refrigerate at least 2 hours before serving.